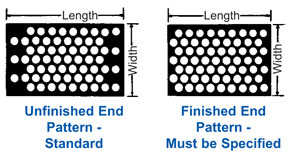 “Unfinished”- Standard end pattern at the beginning and end of the work piece resulting from the stepped perforating procedure pattern. “Finished”- Requires special tooling or idling of the last row of punches to complete the pattern, thus slowing the perforating process and increasing costs. The finished end pattern is not standard and should be specified if desired. Margins along the sides of the perforated sheet introduce stresses into the sheet and cause distortion, so they should be kept to a minimum width. Excessive or uneven margins can actually cause buckling or a degree of distortion that can’t be completely corrected by roller leveling. Additionally, when holes are small and the percent of open area is high, distortion can become exaggerated. 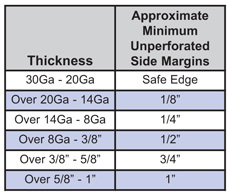 The minimum side margin is determined by the die layout and the thickness of the material.